Just Jingle: Winnie and Walter Leading Lady Take THREE! 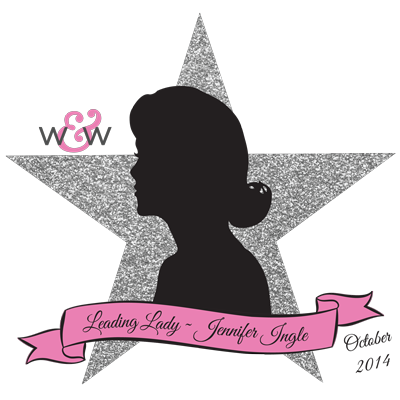 Hello, friends, and welcome to TAKE 3 of my Winnie & Walter Leading Lady posts! I am actually super excited about today's feature! This week we are getting ACTIVE! Before you all run away, I promise not to make you go to the gym. Afterall, the word 'run' only comes into my vocabulary when I am 'running out for ice cream' or something along those lines. So, no. We aren't going to doing squats, planks, or the like, but we ARE going to make our CARDS active! Yup! Today's cards all have some interactive feature on them. The go from simple to more complicated, so there is a little something for everyone today! Eeeek! How much fun is THAT?! I used the chimney stamp to create the end of a table and sat the cat beside it right inside the door. It just makes me happy. 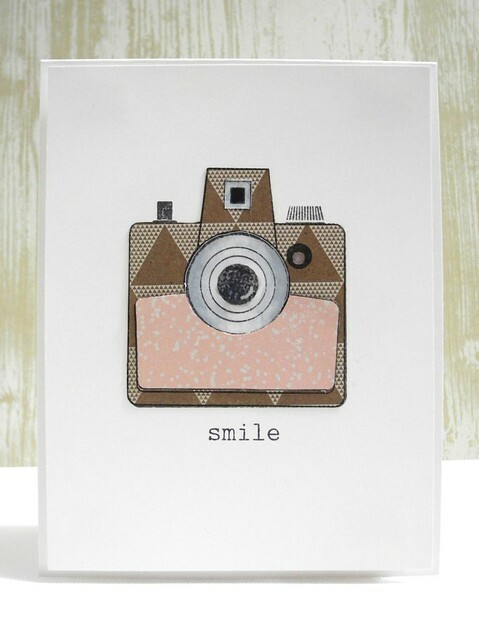 This is such an easy way to add just a small interactive feature to your card! So fun! You HAD to know this was coming! I simply couldn't do a post about interactive cards without a fabulous shaker! I love them so much! For this one I used the Scenery: It's a Wonderful Pennant stamp set in conjunction with the The Big, The Bold, and Seasons set. 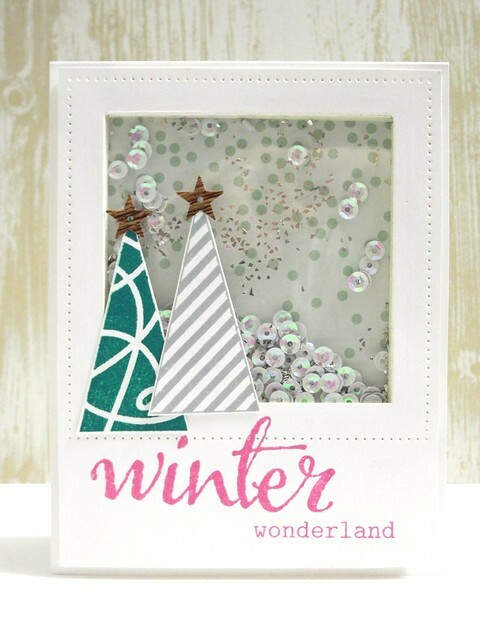 I created a simple little scene with LOTS of glitter and sequins inside! Okay, I can here you now... "Ummm, Jingle, I know this Leading Lady stuff is a lot of pressure and all, but I'm pretty sure that is NOT an interactive card. Nope. I mean, it's cute and all, but it's just an ordinary CAS card." BOOM! That just happened. Yes, my friends, when you press gently on the shutter button on the camera, it lights up! I used a tiny (and I mean TINY) LED, some copper tape, and a watch battery to do some paper circuitry behind the popped up panel. It's all very thin and light weight, so it works great on a card! Thanks so much for stopping by today! 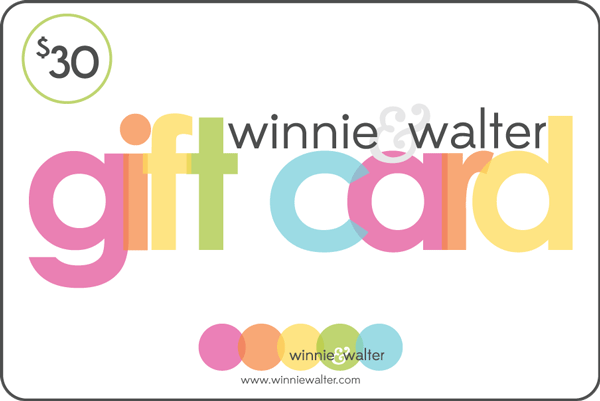 Don't forget to comment on each of my Leading Lady posts throughout this month for your chance to win a $30 Gift Certificate to Winnie and Walter! Absolutely charming interactive cards, Jingle; each one showcasing not only darling stamps (like the dog! ), but your brilliant creativity! The doors, the shaker, the amazing wee light in the camera: pure delight! Love 'em all! Awesome job girl...I do love me some interactive stuff! Loved the camera...any chance of a wee tutorial? OMG Jennifer....could you be any more creative. I love each and everyone of these cards....the flash on the camera is genius and the shaker card is so pretty...definitely my favorite. That is so cool! Love it!! You are so ingenious! Love the camera card! The shaker card has so many sequins--it's gorgeous! Gorgeous cards! That camera card is so fun... love it! Fantastic creations, Jennifer!! The camera card is fantastic. Seriously?! Can your cards be any more amazing? Love them!!! OK...I thought I have already met the two most AMAZING women in card making industry. I accidently stumbled across your blog from the W & W blog. And, Im glad I did. You are right up there with the other two and everyone knows who they are....one even has your name! I really enjoyed your interactive cards..you really upped it a notch and im liking that. Awesome sauce! looooooooove these!!!! Absolutely great work! oh wow!! awesome!! this is the first time I'm seeing something awesome like this!! way to go gal!! What a great variety of cards! Thanks for the inspiration. I love the camera card. I have been trying to think of a way to light up a card. Any more detailed instructions of how you did it? Wow! !awesome cards and that last one..... Genius!! You are just too stinkin' clever ... love them all. So much fun! I love interactive cards and these are all tons of fun! I sure hope you'll be willing to share how you made your camera as it is so much fun and not something I have any clue about how to make...Please? Thanks so much for making me smile (and wonder) today!!! I'm awestruck! Jingle, you have wowed us again! Yes, please, for a tutorial on 'paper circuitry'! You absolutely hit these out of the park....they are amazing!!! Such brilliant idea for creating a scene behind the open doors. And you know I love a good shaker, loving the colours for this one. And that camera, you genius you...its fantabulous!!!! Just fantastic! So amazing ideas and techniques that blow my mind! Thanks for sharing so much fun reading and view your cards! So talented lady! Boom! Boom! and Boom! So amazing! SNAP! Consider my mind blown with your camera card, Jingle! I love all of your cards - the interactive feature of each is cool, but you definitely blew my mind with your flash on the camera card. Hope you can do a detailed tutorial on that sometime soon as I'd love to know more on how you accomplished it. Yeeeah...So I'm pretty sure my jaw just hit the floor! AMAZING.ABSOLUTELY AMAZING. Love the cat, love the cute shaker, but that camera card is over the top! Awesome! 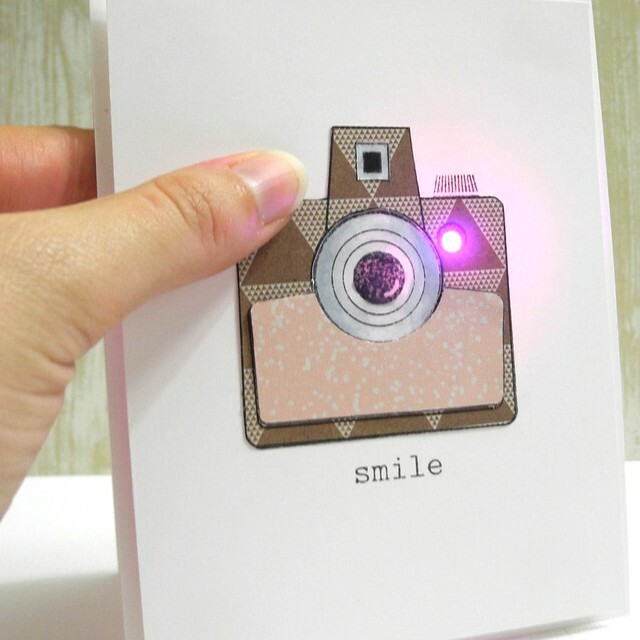 wow really awesome cards.. LOVE that cool camera.. clever designing.. Wonderful cards! I love the "mansion" and thought it ingenious using the chimney for the table; then I came to the shaker card and pinned it IMMEDIATELY; but THEN I SAW THE CAMERA and just giggled with delight! What a terrific idea! LOVE IT ALL!!!! Great job creating your interactive cards! I love that camera! Brilliant! Each card is amazing, thanks so much for the inspiration! Jennifer... Only thing that I can speak of about this is.... I am speechless !!!!! Cool, Cooler, and Coolest. Awesome. You are so clever. Oh my gosh...these interactive cards are my favorites so far! LOVE that camera flash! Amazing cards Jennifer. I agree I love the doggie silhouette in that awesome house set. Gorgeous colours on your shaker card. I'm going straight away to show my electronics loving husband that LED flash. What an awesomely clever idea. You so soooooooooooooooooo brought it Jennifer, I mean you pulled out all the stops. Whoa, a camera card that lights up? That's genius. Love your cards, still speechless over the flashing camera. Are you going to do a tutorial? Love how you used the house with the little cat inside, but you know that that camera card just totally takes the cake. SO COOL! OH MY!! I LOVE THAT LITTLE LIGHT!! That's a super cute idea! What fabulous and creative interactive cards! Wow was totally loving your cards and then Bam! You hit with the last card and I was like .... WOW!!!! That's so awesome and fun! Way to rock it! I love the moveable door on this card. Clever idea. These are amazing! Love the opening doors to find the kitty! Cute! 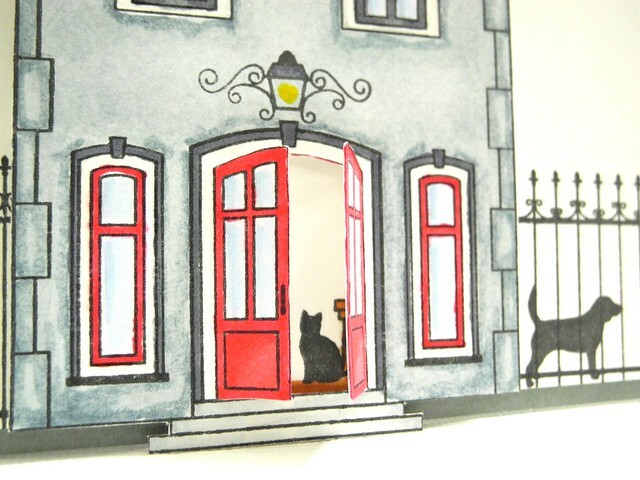 I like the cat just inside the door! Love the house card! All of them are cute! I love these cards. Your camera is super awesome! WOW! All three cards are amazing! Interactive cards are just so much fun! Fun, fun, fun are your interactive cards! The "flash" in your camera is brilliant - never seen that before! wow, wow, wow! love them! F U N and FABULOUS cards Jennifer!!! I have GOT to try them ALL NOW!!! Completely ingenious idea of the led light! Awesome card Jennifer! I have always said how clever you are, but you have taken the cake with that "flash" camera one! And congratulations! So happy to see your success! 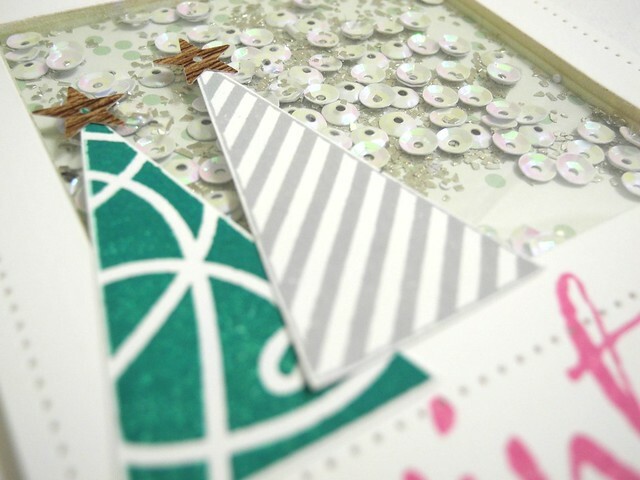 I definitely need to make some Christmas shaker cards this year! Yours is so pretty and fun! Wow...a light-up card! I'm impressed! The camera card is beyond impressive! So fun..and so imaginative! 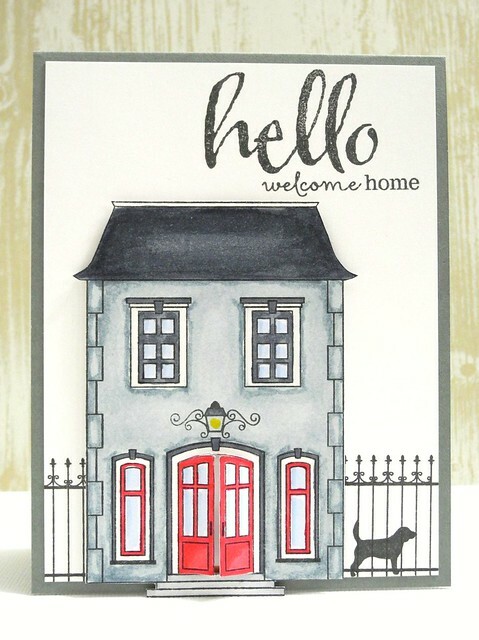 And that house with the doors that open...absolutely charming! Interactive is the BEST. Thanks for sharing these great cards. Oh wow, you are always so clever with your designs...these are amazing! I love both of these interactive cards.